It is well known that Greeks and Turks don’t get along that well. Since the founding of the modern, independent state of Greece (1829) and the young secular state of Turkey (1923), friendships have been built but broken even more quickly and these days, the two governments fight each other over the sea borders in the Aegean, and the large number of the refugees that flow into Greece from Turkey. Nevertheless, here on the island of Lesvos people are trying to re-stablish travel links between the two coasts. After the Cyprus crisis (1974) there was no traffic at all, but commercial interests have met together in recent years, and there is at least one weekly ferry between Mytilini and Ayvalik and for the past year a boat connecting Mytilini with Dikili. A century ago thing were very different. The sea between Lesvos and Ayvalik was a vital passage for all kinds of boats going back and forth and Mytilini was an active commercial centre communicating the East and the West. Lesvos was still part of the Ottoman Empire, and there was a lot of trade and commerce with ports around the Black Sea and Russia. In the 19th century business was mostly with Edremit and Ayvalik (in Greek Ayvalik is Kidonies; Skala Kidonies, between Mytilini and Mandamados is named after Ayvalik). Not only goods were traded (Lesvos exported olive oil and soap and grains were imported), there were also many Greek men from Lesvos going to Turkey - from August to October to help harvest the corn. More than one man found happiness in Turkey and left his wife and children on Lesvos, a cause for the break up of quite a few marriages in those days. When in the middle of the 19th century steam ships moved into the Aegean Sea, Mytilini got even more work thanks to commission trade. Because the new ships were too big for the small harbors on the Turkish coast, their goods were unloaded and stored in warehouses in Mytilini and then shipped across by smaller vessels. That business did so well that by the end of the 19th century that many big churches, public buildings and industrial complexes on Lesvos were built, most of them with materials from the Ottoman Empire — especially beautiful pink rock from the island of Sarmousak (close to Edremit), bricks from other regions, huge tree trunks for roof rafters and basic products used in the olive- and leather tanning industry. The symbiotic relation between both coasts was not only commercial, but social and cultural, as people from Lesvos bought land, and set up businesses and bought or built houses in Turkey. In 1912 the East Aegean islands Lesvos, Chios and Samos were taken back by the Greeks and the islands became part of the modern Greek nation. Immediately, the commerce that had been flourishing was subject to taxation: a 1% Greek tax on exports, and a 11% Turkish tax on import so, for Turks, products from Lesvos became more expensive than local Turkish goods, and so trade between the two sides went into decline. When the Greek army, that had foolishly invaded Anatoly, was beaten in 1922, most of the Greek orthodox population was expelled from Turkey (as were the muslims from Greece). This ‘Catastrophe’ as all Greeks know it, lead to the death of commerce between the Greek islands and Turkey and ever since that time there has been tension between the two countries. Lots of people on Lesvos are not happy with the difficult diplomatic situation created by both governments and want to establish their own commercial contacts with Turkish people. For example, they export sardines from the Gulf of Kaloni and many islanders go to the other side to buy things that are cheaper in Turkey. If you make the trip you will see for yourself how many Greeks are carrying whole towers of household goods on the boat from Ayvalik to Mytilini. Other Lesvorians are just curious to find out how their grandparents who lived in Turkey used to live, and some families even still own the houses in Turkey. Turks also visit Lesvos as tourists. 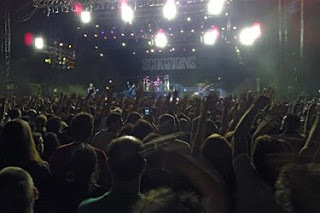 Last Saturday a record number of Turks came over to attend a concert in the castle Mytilini by the veteran German heavy metal rock group the Scorpions. Some 500-1000 people were expected to come over, but in the end, the crowd was so huge and enthusiastic it was hard to know who was Greek and who was Turkish. Thousands of people enjoyed what was for Lesvos a special concert. It was very well organized and could be heard all across the city. The old rock stars were in great shape, as were the fans who waved their arms with their mobile phones, jumped around, danced to the great guitar playing of Rudolf Schenker, the pounding drums of James Kottak and joined in as Klaus Menke sang the band’s big hits. Greeks and Turkish together sang amongst others ‘Wind of Change’, ‘Send me an Angel’, ‘Still loving You’ and ‘Rock You like a Hurricane’. Many recalled the poignant shared memory of the huge earthquakes that happened in Turkey in 1999, and the smaller one in Athens later the same year, events which inspired many people to take a first big step towards a new friendship between Greece and Turkey. The Scorpions did that movement proud, creating an event which allowed people of these two nations, who share hundreds of years of the same history, to stand side by side, for at least one memorable night for Lesvos.